We talked to some experts for answers to the ever-elusive question—what shoes are best for travel? Hint: They’re not packing gym sneakers. The most popular shoes among tour guides, travel writers, backpackers, and business travelers vary, but a few brands stand out above the rest, and some recommendations are unusual enough to inspire us to try something new. 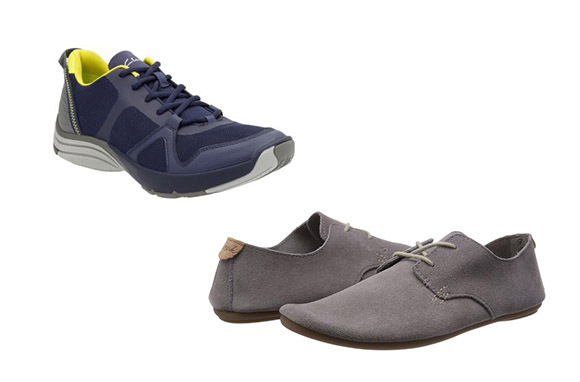 From yoga mat-lined oxfords to foldable flats and classic snow boots, here are the shoes that travel experts pack. 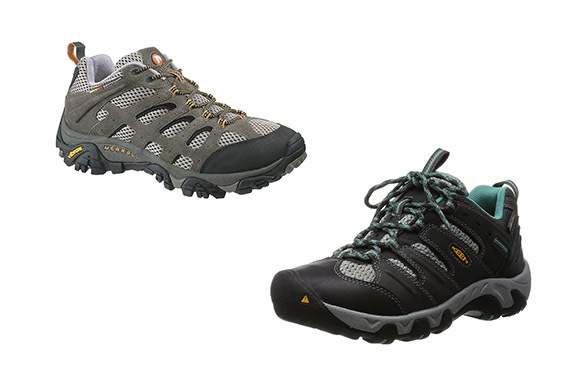 If youâre an adventure traveler, you need solid hiking shoes that will last for years. Solo traveler Monica Williams says she trusted KEEN Women's Koven Hiking Shoes for 16 months of trekking across Spain, Ecuador, Colombia, Bahrain, and Jamaica. "They were not only good enough for hiking the Camino de Santiago but I also used them for everyday purposes such as walking or working out," Williams says. "Because they contained Keen.DRY, a waterproof membrane that kept my feet dry … I've worn these shoes for several years now." Male tour guides and hikers at ITMI (the International Tour Management Institute) recommend Merrell Men's Moab Ventilator Hiking Shoe to us. They were passionate about Merrell shoes overall. "They are sturdy, have great support, are comfortable, waterproof, fit all shapes and sizes of feet—wide, lumpy, normal," an ITMI representative says. If you're heading somewhere sandy, you'll want airy sandals that will stay on your feet. ITMI's female guides love KEEN's Dauntless Strappy Sandals while writer, photographer, videographer and travel blogger Jonathan Look Jr. recommends KEEN Men's Newport Sandal. "[They] are without a doubt my favorite shoes," he says. "They are sandals, but not obviously so. They look great with jeans, shorts and under the right circumstances, with khakis and a button shirt. They are waterproof, and comfortable for hiking or walking around the city all day." Business Traveler Lauren Wire swears by Yosi Samra foldable flats and slip-ons for comfortable travel. "I live by them for the plane rides," Wire says. "They are so easy to slip on and off!" For a men's equivalent that's comfortable and easy to slip off and on, try KEEN Men's Glenhaven Slip-On. Casual comfort shoes are often the best engineered, with enough support to keep you feeling limber even after being on your feet all day. Clarks' WaveWalk Quantums come highly recommended by John Thomas of wholesale vacation club WorldVentures. "I only use the Clarks WAVE shoe," Thomas says. "They come in many styles and colors … I have worn them on five continents." For a women's shoe equivalent, Sanuk Womenâs Biancas pack flat and have yoga-mat insoles for cushioned comfort that you'll be grateful for after zipping through the airport or running to catch your train. Comfort and high-end style are not mutually exclusive. 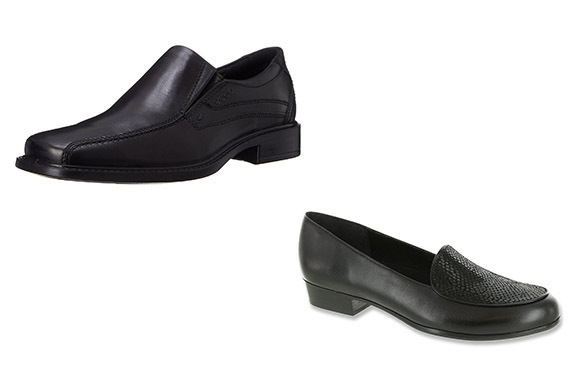 For business travel, a comfortable and elegant option for men is the ECCO New Jersey Slip-On Loafer, which is a trusted shoe recommended by many male ITMI tour guides. 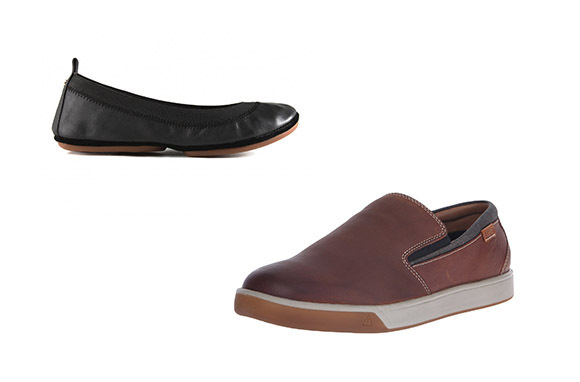 ITMI's female tour guides swear by Munro American Mallory Slip-On loafers, or, as more casual and packable business-trip option, Tieks by Gavrieli, which fold in half and offer lots of underfoot cushion. When it comes to keeping your feet happy and blister-free, you don't need to resort to gym shoes. Stylish casual options often have the best support for walking, and can make a fashion statement. 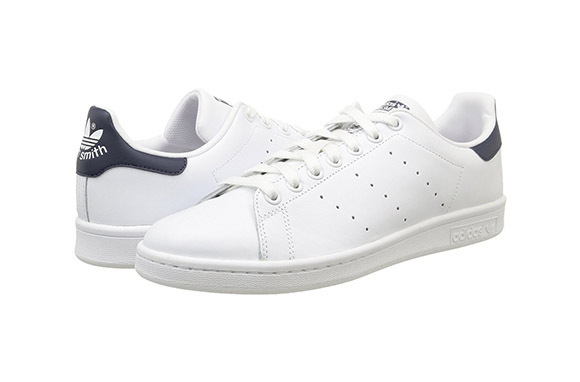 Travel writer and backpacker Blakely Downs says she loves Unisex Adidas Stan Smith Originals for comfortable trekking, especially because they're on trend and she has limited space in her backpack for outfit options. "They're comfortable, supportive, and on trend with the latest sneaker fad," Downs says. "I have to pack things that work in many different scenarios … You can dress them up or down and not punish your feet along the way." As an added bonus, they come in many different styles and colors or prints for both women and men. 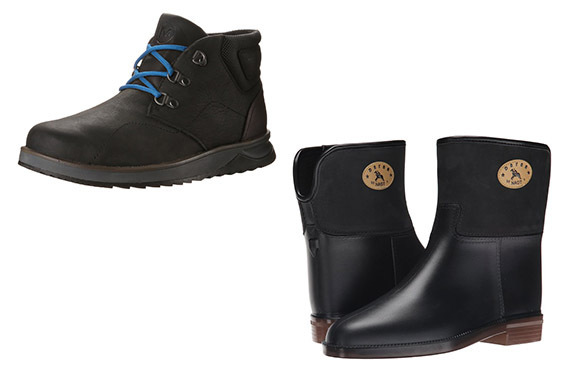 If you're going somewhere wet enough to warrant rain-safe shoes, you'll want a pair that you can wear in almost any setting. Tour operator Ruth Berman only wears Merrell and Naot due to her orthopedic issues, and says their styles offer the best support. Naotâs Women's Amy Rain Boots are both utilitarian and stylish—sure to keep your feet feeling dry and supported. For men, go with the brand that experts swear by when it comes to walking in the elements—Merrell. Its Menâs Waterproof Epiction Sneakers are waterproof and durable, yet lightweight thanks to air-cushion shock absorbers and a removable foot bed. They look great, too, and come in three colors. Braving snow on a trip requires reliable, warm boots. Travel agency owner Christina Ernst wore Jambu Womens Artic-Vegan Snow Boot on her arctic sailing expedition and promises they don't disappoint. "I spent a week sailing and hiking around Svalbard/North Pole/Arctic Ocean," Ernst says. 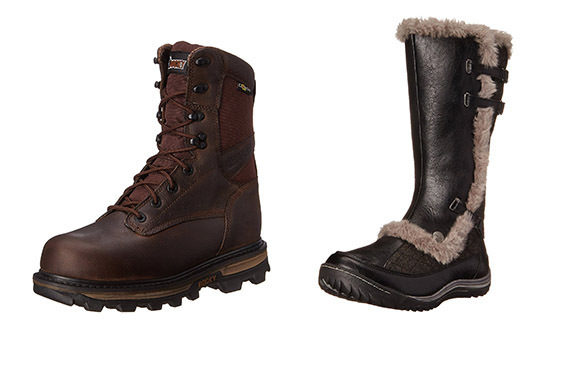 "[They were] the best pair of warm wonderful boots that worked well on the tundra and ice." For men, ITMI's male guides swear by sturdy Rocky brand boots. The brand's Arktos 047 Snow Boot are affordable and feature five layers of outsole to keep water out and body heat sealed in. 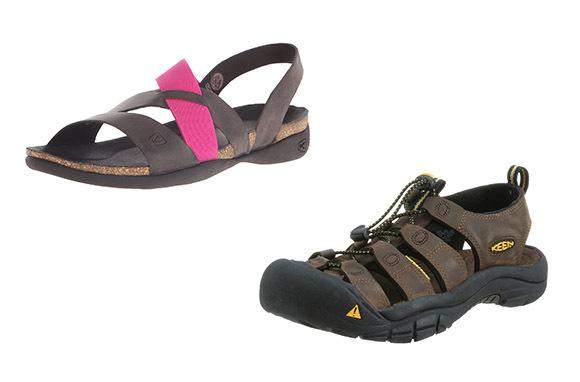 They're also a versatile brown leather that go great with casual clothes or all-out hiking gear. Shannon McMahon is an Associate Editor at SmarterTravel. Follow her on Twitter @shanmcmahon_.